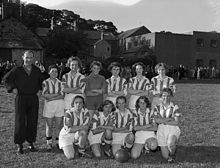 ^ "Home Front - The Forgotten First International Women's Football Match - BBC Radio 4". BBC. Retrieved 15 June 2018. ^ "Croft Park, Newcastle: Blyth Spartans Ladies FC, World War One At Home". BBC. Retrieved 15 June 2018. ^ Williams, Jean (2014). "2: 'Soccer matters very much, every day'". In Agergaard, Sine; Tiesler, Nina Clara (eds.). Women, Soccer and Transnational Migration. Routledge. p. 26. ISBN 1135939381. ^ "Coppa Europa per Nazioni (Women) 1969". Rsssf.com. 19 March 2001. Retrieved 12 September 2009. ^ "Inofficial European Women Championship 1979". Rsssf.com. 15 October 2000. Retrieved 12 September 2009. ^ "Rec.Sport.Soccer Statistics Foundation — Women's FIFA Invitational Tournament 1988". Rsssf.com. 6 July 2007. Retrieved 12 September 2009. ^ Christenson, Marcus (16 January 2004). "Soccer chief's plan to boost women's game? Hotpants". London: the Guardian. Retrieved 9 February 2007. ^ "Football: Said and Done, The Observer (London); Sep 21, 2008; David Hills; p. 15". Guardian. 21 September 2008. Retrieved 12 September 2009. ^ "Iran's women footballers banned from Olympics because of Islamic strip". London: Guardian. 3 June 2011. Retrieved 14 June 2011. ^ "Mahmoud Ahmadinejad blasts Fifa 'dictators' as Iranian ban anger rises". London: Guardian. 7 June 2011. Retrieved 14 June 2011. ^ Dehghanpisheh, Babak (17 July 2011). "Soccer's Headscarf Scandal in Iran". Newsweek. Retrieved 6 January 2016. ^ Alistair Potter (30 June 2011). "Cash-strapped Russian team to play in bikinis to bring back fans". Metro. Retrieved 30 July 2011.